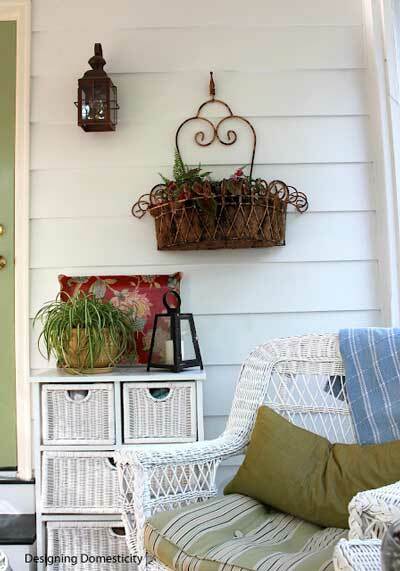 Looking for some inspiring summer decorating ideas for your porch and yard? Nothing like a big dose of curb appeal for your home in the summertime. Mary and I recommend you go "light, bright, and comfortable" for summer. And for sure please enjoy some "porch sittin" time, too. That's what a porch is all about, right? Relaxing. 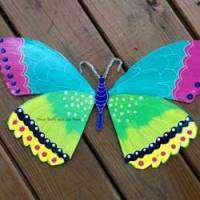 When creating your summer masterpiece, look for items in and around your home, at garage sales, or you can even make them yourself. Decorating for summer can be easy and plain fun without breaking your budget. 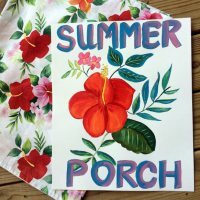 Summer porch decorating ideas - hope you enjoy what you see here! 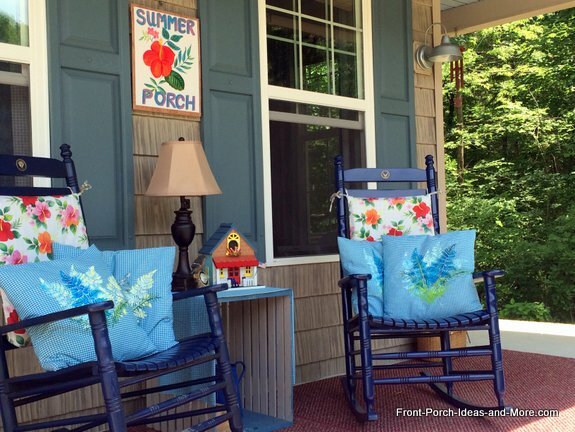 These are stenciled pillows and a cheerful sign we did for our porch. Enjoy all of our ideas below too. 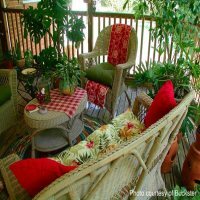 Create a summer porch that is bright, colorful and happy. For your porch landscaping or simply for a summer decorating idea. We show you both ways. 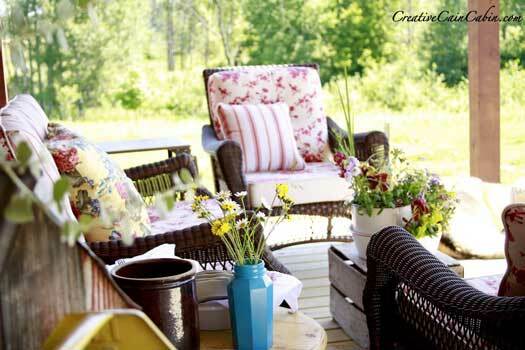 We show you how we created a fun summer porch with ideas you can use. 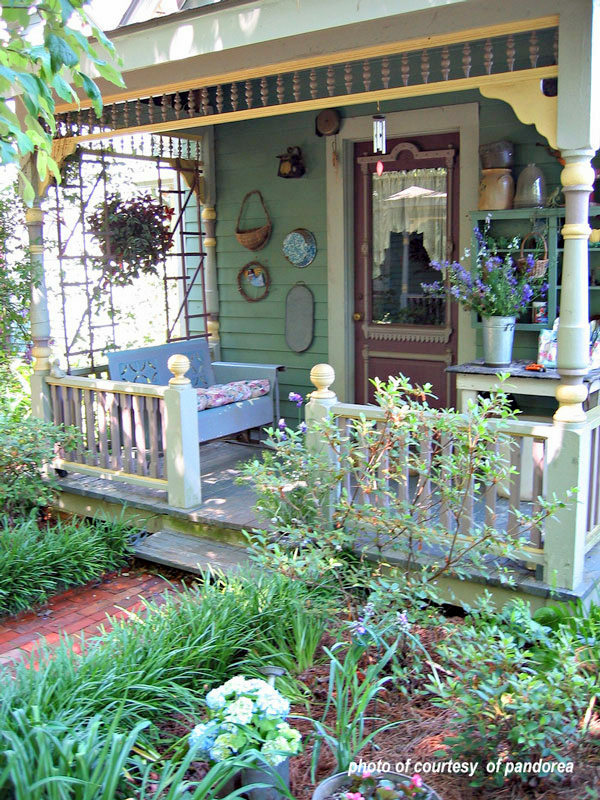 See these wonderfully decorated summer porches from across the country. Want Some Outdoor Room Ideas? Outdoor living at its very best. 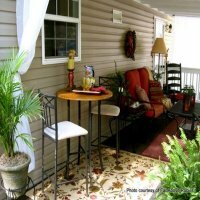 Anita shares her front porch along with her other outdoor living spaces. Her mountain home and surrounding woods make for an idyllic setting. 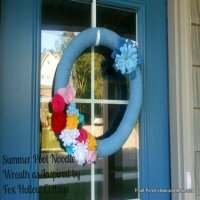 A quick and easy summer wreath from a pool noodle and fabric flowers. Inspired by Fox Hollow Cottage. Easy to make. 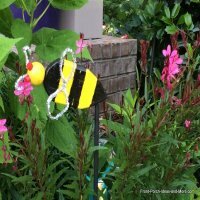 Our grandchildren helped with these bumble bees for our porch garden. 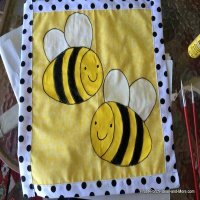 Everything easy with a simple bee theme. Cute as a button summer porch. Anna is a true southern flower gardener. 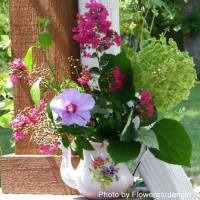 She decorates her home and her porch with flowers. Hydrangeas are her favorite. 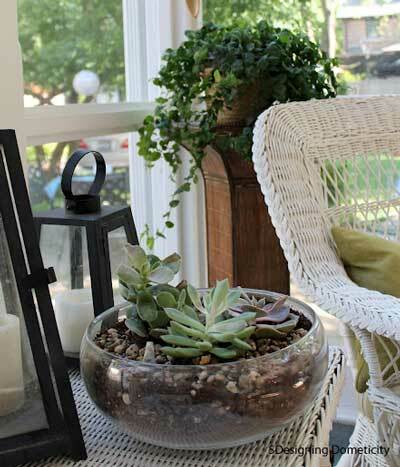 We really love Anna's porch decorating - it's a dream porch that we know you'll enjoy, too. Dawn has the knack of porch decorating down. Her porch is splashed with the color red. Decorating with red is not only fun, but the results are deliciously inviting. Dawn shares her affordable and easy decorating ideas with us. You'll be surprised at some of her finds. Decorating for summer is all color, comfortable styling, and easy entertaining ideas. Summer decorating is easy and fun. 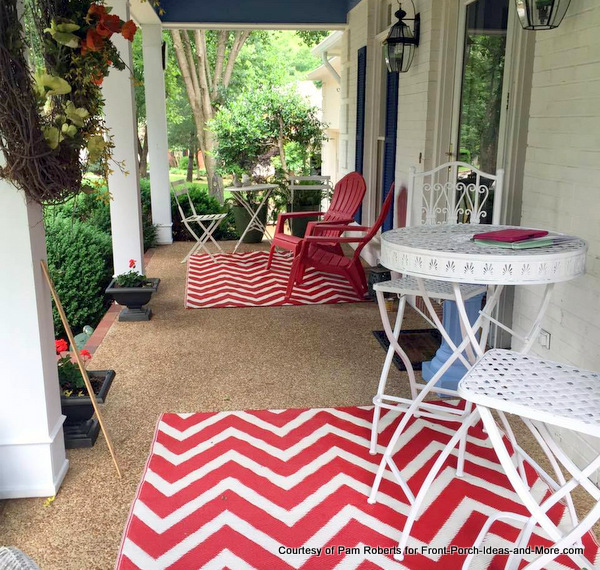 Make your porch sizzle in the summer! We don't get to see side porches often. Debbie's home has a beauty. 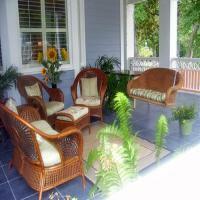 Come see pictures of porches from our readers. 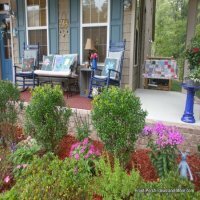 Dawn, of Creative Cain Cabin, shares her lovely log cabin porch decorated for summer. 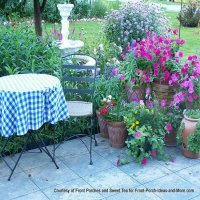 It is an eclectic mix of her whimsical quilt, gingham and sweet peas = total nostalgia! 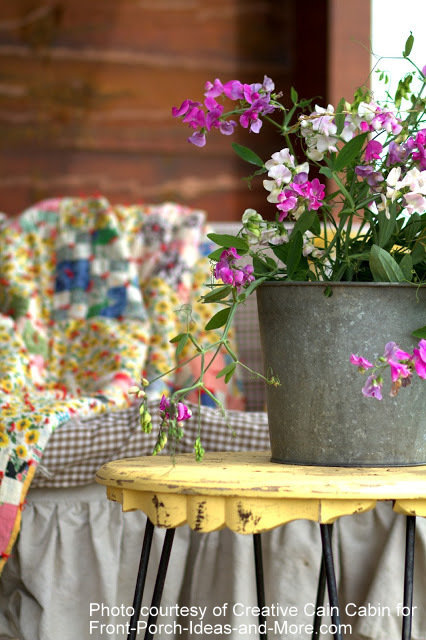 Do you have a bucket of sweet peas or daisies to dress up your summer porch like Dawn? 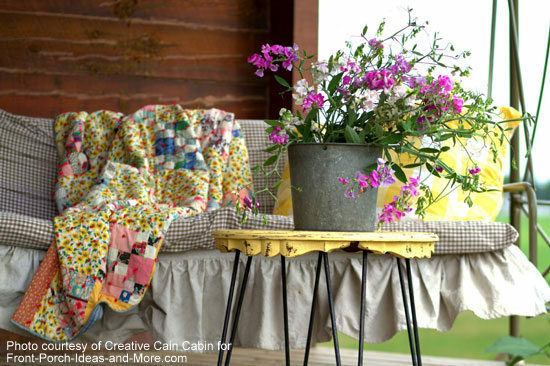 Dawn, author of Creative Cain Cabin covers her porch cushions and pillows every year with bright cheerful colors. This is an example of how she mixed floral and striped fabrics for a shabby chic, almost romantic, feel. Above she mixed checks, stripes and gingham to create true whimsy! Take note how she used a simple wooden crate as a table and placed an old wash bowl filled with a country bouquet of flowers on top. Simple. Beautiful. 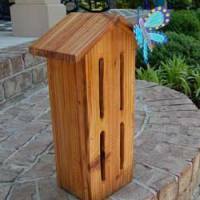 Do you think you could replicate this on your porch? Absolutely. 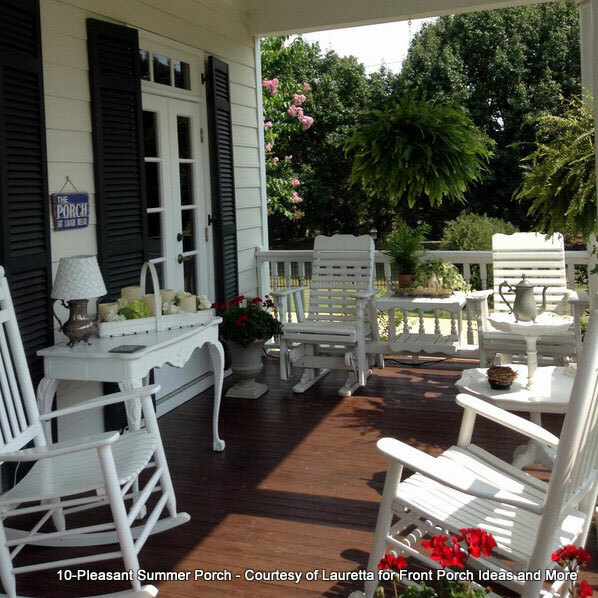 We sure love Dawn's porch; it is simple, yet stunning. 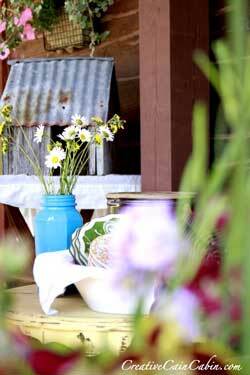 Do you see the pretty blue jar with a bunch of daisies? Just plain sweet. You can't help but notice it. Dawn's colorful patterned plates and silverware are both decorative as well as practical. Just begging for a slice of apple pie and a glass of sweet tea - she's ready for guests anytime. 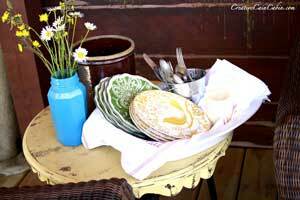 We leave Dawn's porch to discover other wonderful summer decorating ideas - but you can come back, of course. Please visit her blog, Creative Cain Cabin. Looking at Pam's porch from the other direction you can see her charming wicker porch swing. 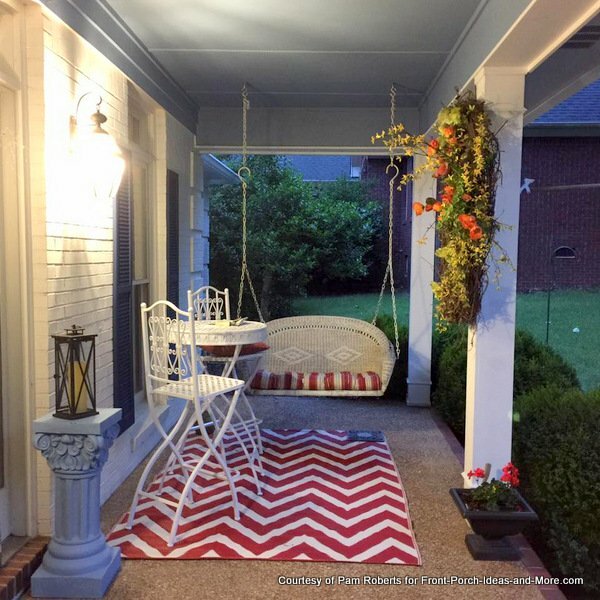 She dressed it up with a red and white striped porch swing cushion which is fun with her other accessories. We really enjoy the fancy white bistro table and chairs! So where's the blue, you ask? Look at Pam's porch ceiling. She recently painted it a beautiful shade of blue, a color often seen in the south for a porch ceiling. Check out our haint blue porch ceiling page for interesting trivia about blue porch ceilings. Red and white - thanks to Pam for this summer decorating idea. You can count on Eileen of The Seasonal Home to share summer decorating ideas that are simple, inexpensive and eye-catching. 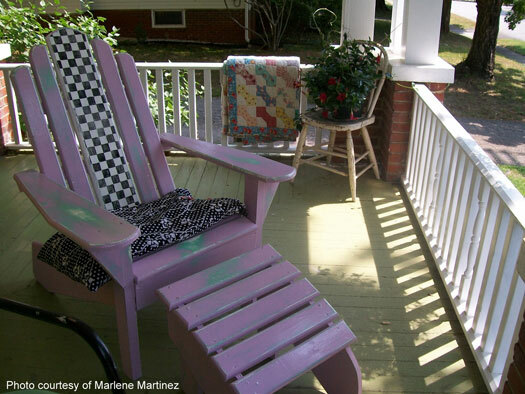 Take a look at her outdoor furniture makeover. 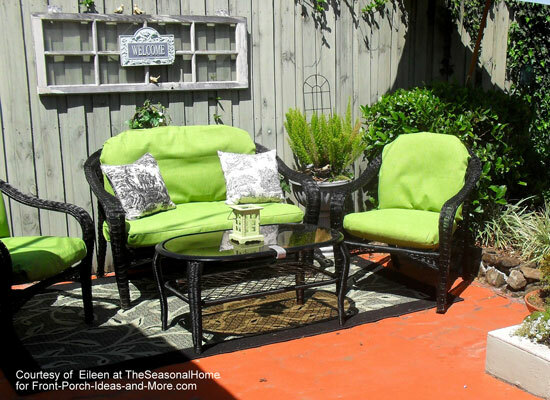 Eileen updated her older wicker furniture with 8 cans of black spray paint and 6 yards of lime green outdoor fabric - for a mere cost of $62. She found the fabric remnant at Old Time Pottery. 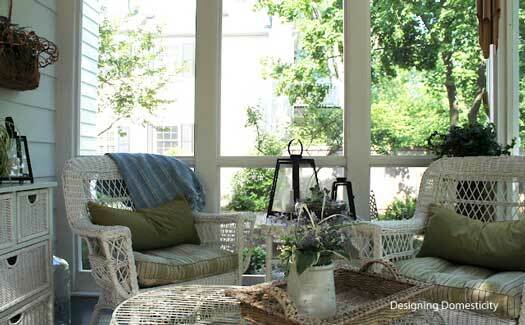 Liz, of Designing Domesticity, has a screen porch to die for. Can't you just picture yourself curled up in one of Liz's wicker chairs with a good book, sipping on a mint julep, and taking in a gentle breeze? We sure can. Decked out in white wicker furniture with thick comfy cushions and pillows in pastels, Liz's screen porch has an aura of a peaceful respite for good conversation. The wicker basket shelving unit is a great place to store, and easily retrieve, dinnerware, napkins and extra candles. Don't you love the soft sage green color of Liz's door? It helps create that peaceful feeling and reflects light back into the room. 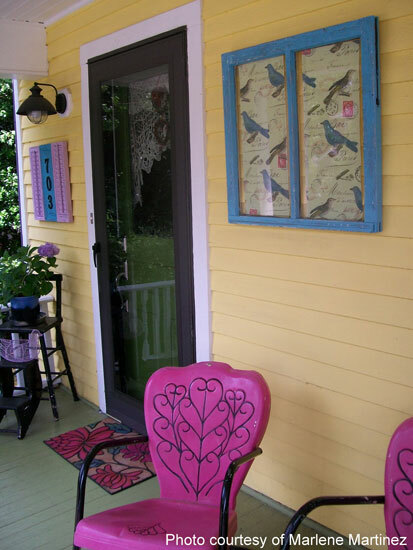 Choosing the right color for your door can make a huge difference in the overall appeal of your porch or screen porch. Experiment with colors until you find the perfect one. Ask your hardware store for small samples of paint - sometimes there is no charge. And remember, you can easily change your door color. Do don't sweat over it. Liz's screen porch is a 10x10 foot space and she uses it wisely. We think she's smart to not be ostentatious with decorative items which can crowd a small space quickly. 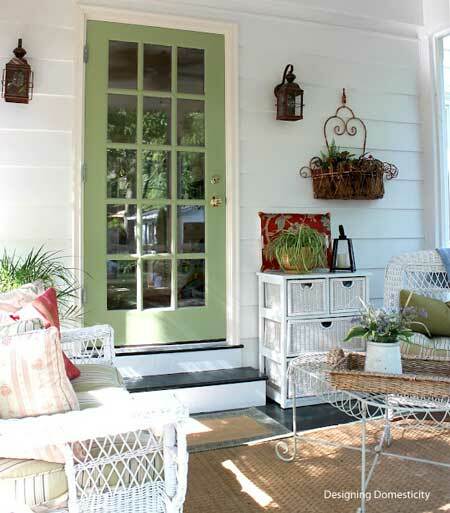 Enjoy greenery on your porch. Adding a few as Liz has done, brings the outdoors right onto her porch. This succulent arrangement makes a good conversation starter. Thanks, Liz, for inviting us onto your porch. Enjoy Liz's ideas at Designing Domesticity for more inspiration. For summer classics, vintage-style outdoor furniture is a favorite to many of us. 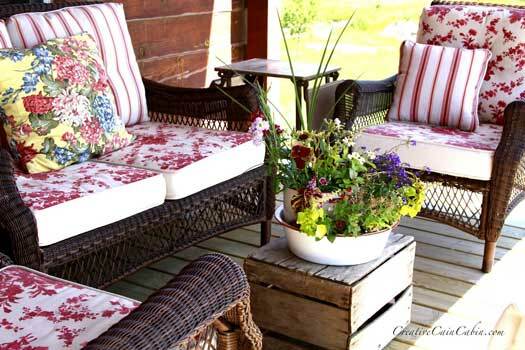 You can mix and match or create an entire porch seating area with vintage metal furniture. My parents were fond of vintage furniture and I remember my Dad sandblasting the rust from several pieces he had found for their porch. Marlene shares with us, "The green metal chairs are from my childhood that my father sat on under the huge maple trees in the summer time after he came home from a long hot day of brick laying. I cherish those chairs." The charming old window has a reproduction bird poster glued behind it. And do you see the house numbers? Marlene made them from old window shutters found at a flea market for just $3. Marlene buys what she calls "mistake-paint" from home improvement stores. And you can see the lovely results here. We appreciate Marlene's summer decorating ideas so much. 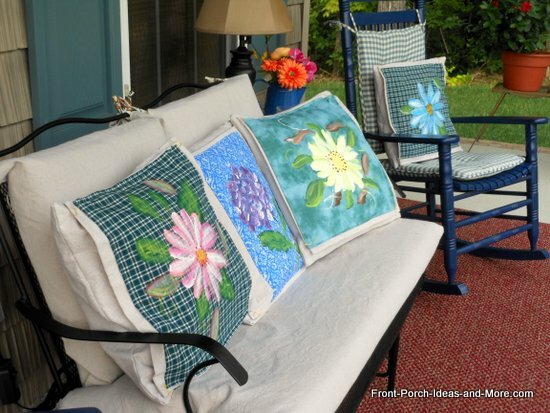 See how Mary created these easy and innovative porch pillow toppers along with Anita's Summer Porch Decorating Ideas. 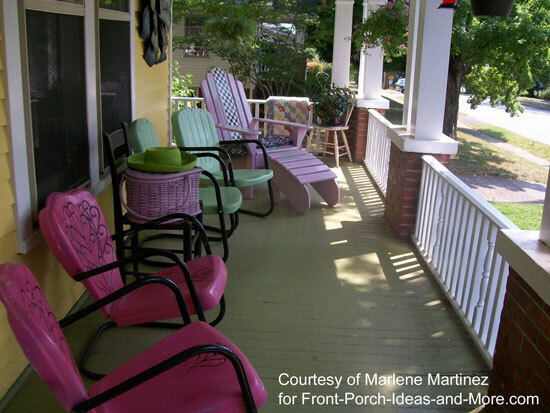 Might you have a handy idea for decorating your porch? Please share your ideas and we will show it off to everyone.